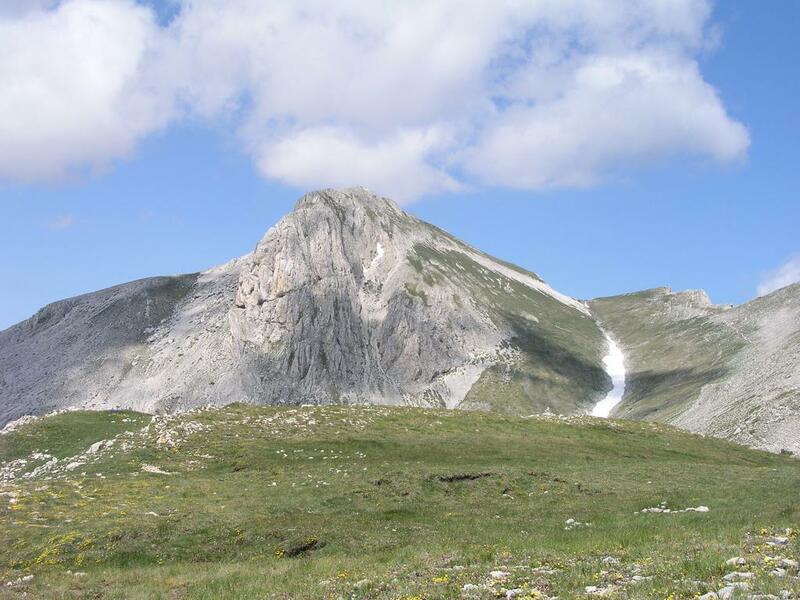 Saddle: Vado di Corno, 1924m, 2.5 km east, 1 km north of Campo Imperatore. How to get there: The trailhead is 2 kilometer up a side road from the mountain road connecting the villages Assergi (west) and Farindola (east). 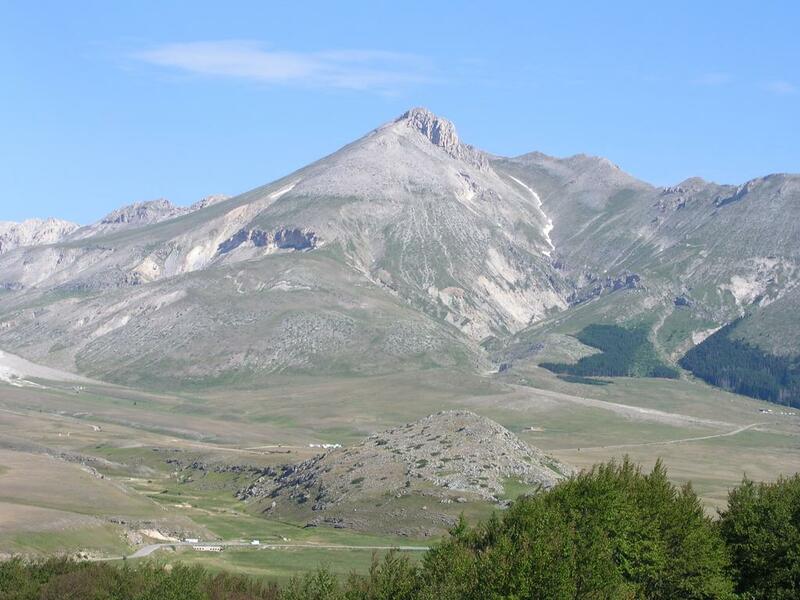 This side road is about 10 km after the side road to Campo Imperatore when going east. It is about 1.5 km after the intersection where a road goes left to the village Castel del Monte when going west. This road heads north from a distinct bend on the road where one can buy cheese and meat, many caravans may be parked there and it seems to be popular to have a picnic at this spot. The parking is on a right fork at the end of the road. This parking area is at elevation 1610 m, the location is North 42:25.469, East 13:44.588. Route description: This hike is often done as a round trip, up trail 8A, then down trail 8B or in the reverse order. The quality of trail 8B (a nice ridge walk) is quite superior to the more direct ascent of trail 8A (a trail in a big hill slope), one may therefore also consider to take trail 8B both ways. The entire hike is on a nice trail, difficulty (YDS) class 1. Trail 8A: This is the shortest and most direct trail. Hike west staying below the forest until you cross the stream bed. There is a track from forest work that can be followed initially. The trail heads up along this dry stream on its left (west) side. This route climbs fairly steeply, then contours around into the proper valley then continues a rather sustained climb until it merges with trail 8B (that enters from the right). The route continues to a distinct col (2500m) at the top of this small valley. The final ascent starts with a short section of loose gravel, then a short traverse on the slope terminating at the summit. Trail 8B: This trail starts out through the forest behind the stone cabin. It heads up among big trees, bends right and enters the open hillside above the trees near a distinct gully. The trail proceeds in several zig-zag bends to climb the ridge fairly straight up from the parking area. 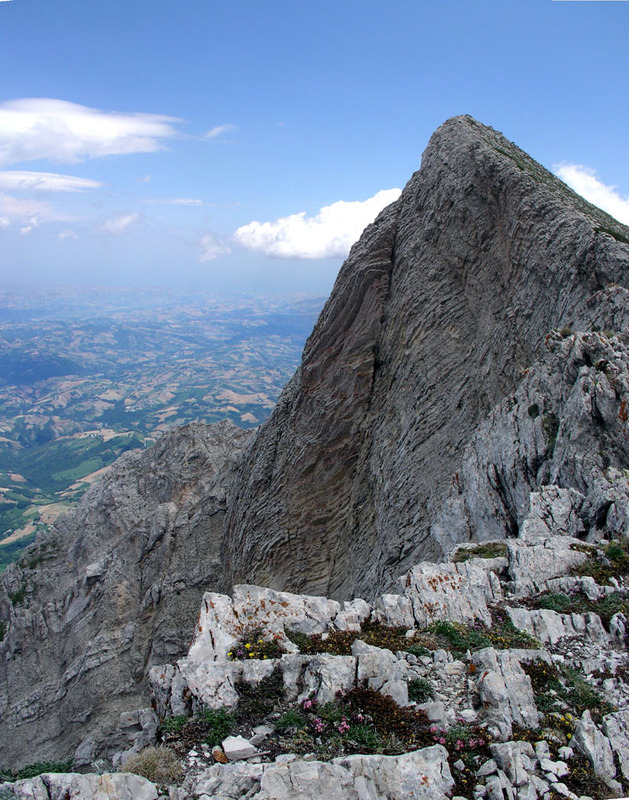 Once on the ridge (about 2000m), the route turns north-west along the ridge and proceeds to climb the top called Monte Tremoggia (2350m). This is a fine ridge walk with very nice views both east and west. Eventually, the route merges with trail 8A before the last section to the summit. 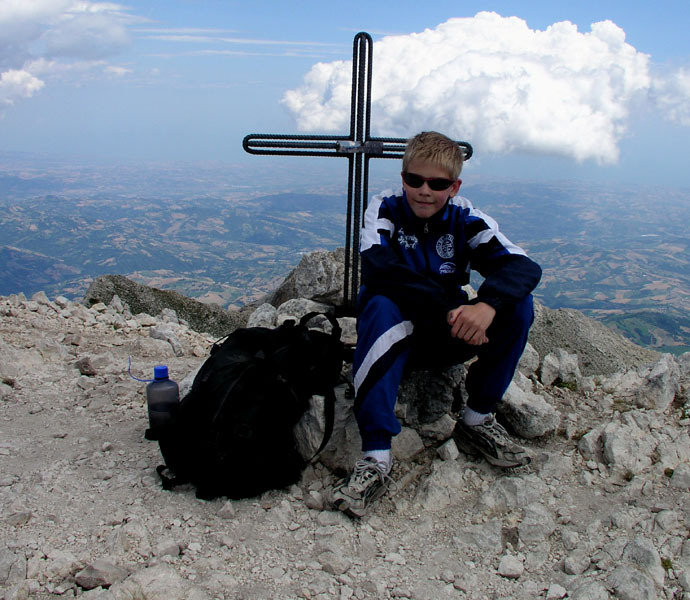 Comments: I did this hike with my son Pål Jørgen, age 15. My wife Heidi also came along to the last saddle before the summit. 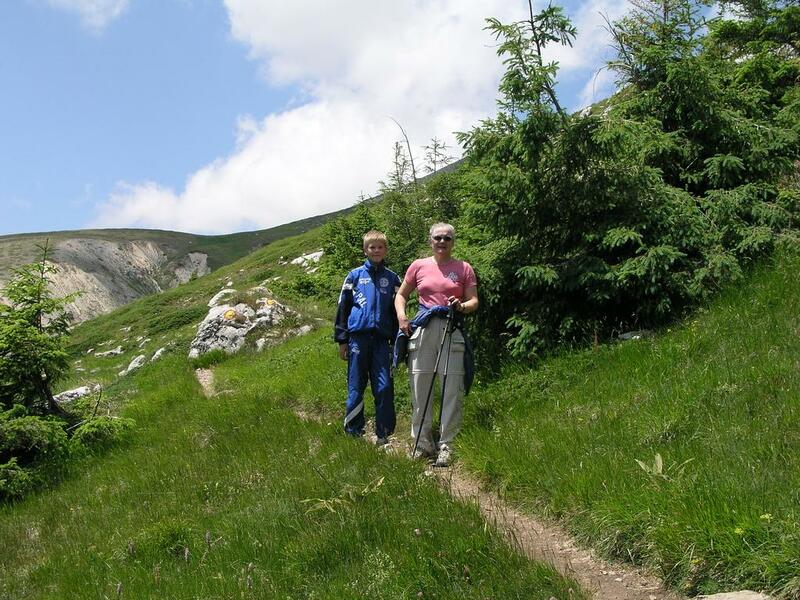 This climb is quite suitable as a family hike, nice scenery, a good trail all the way to the summit. We started at 0945, arrived at the summit at 1200. We spent 15 minutes there enjoying good weather and a very nice view. A one hour descent got us back to the car at 1315. 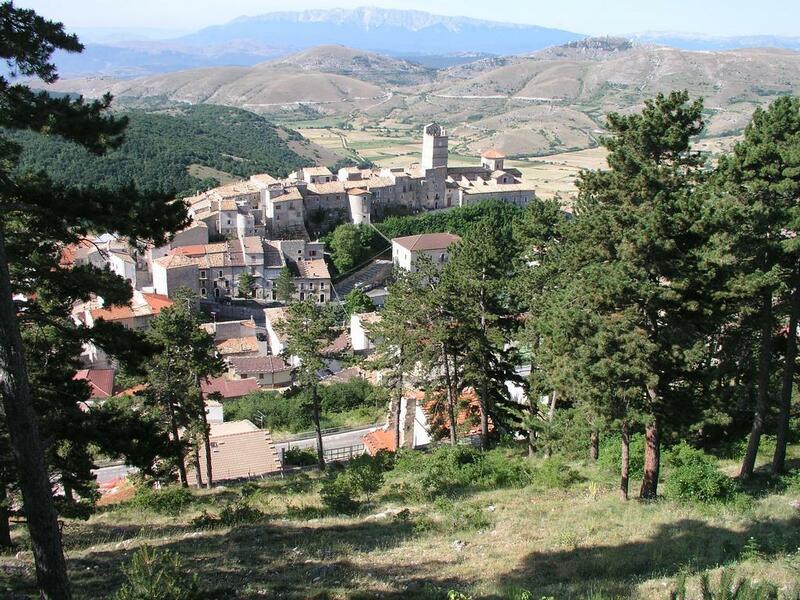 A good place to stay is actually in the very nice small village of Castel del Monte. Just as you enter town (from the mountains), there is a hotel on your left called Hotel Parco Gran Sasso. The rates were reasonable and the service including a nice 5 course dinner, both friendly and efficient. (Phone 0862-938484, email: htlparcogransasso@tiscali.it, www.hotelparcogransasso.tk). 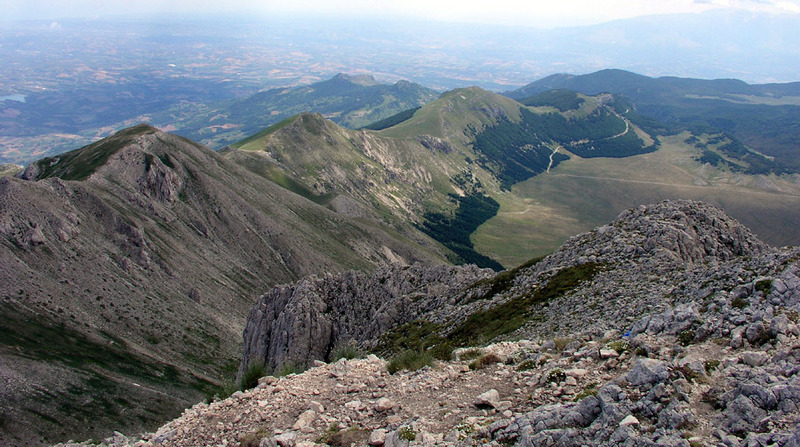 Our trip continued (3 days later) with a climb of Col Nudo. Camicia, as seen from the road to Castel del Monte. Camicia, as seen from the trail along the ridge. On the summit of Camicia. The ridge leading to the final col. The lower part of the ridge stretching south. The view east from the last col. 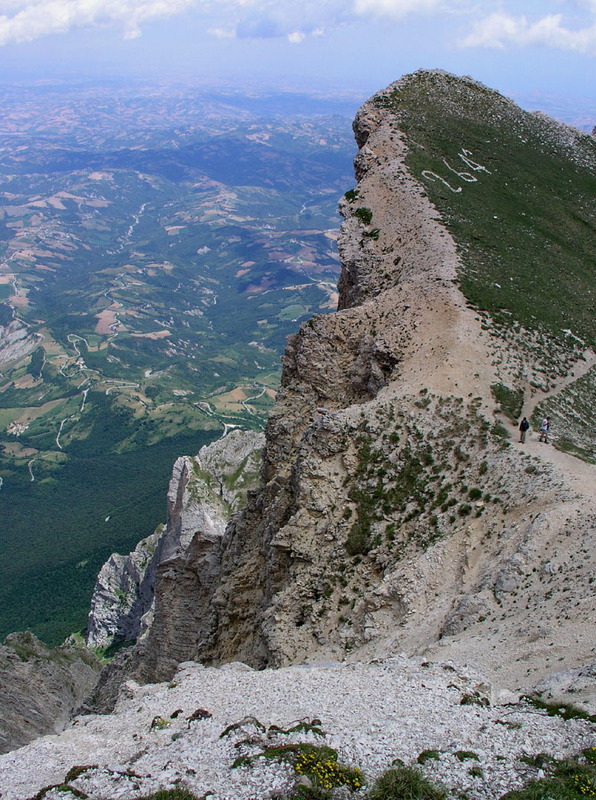 The drop is impressive, one can see the Adriatic Ocean. On the lower part of the trail from Camicia. Castel del Monte, a charming village where you may find accommodation.